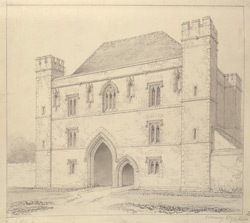 A drawing of the great south gateway (also called Ely Porta) to Ely Cathedral in Cambridgeshire, by the architect and antiquary Edward Blore. It dates from 1397. It is of an usual design for a medieval gatehouse. Firstly it is incredibly broad -the entrance arches look small in comparison with the accommodation above. It was wide enough to contain square rooms on the left and right of the archway. Secondly the flanking towers are square rather than polygonal and rather slight. They do not overpower the gateway like so many medieval gatehouses. During the middle ages, Ely was the site of a influential Benedictine Abbey. Its Minster achieved cathedral status in 1109. After the closure of the Abbey in the 16th century, the Minster and some of the buildings of the abbey precinct, such as the Ely Porta survived.